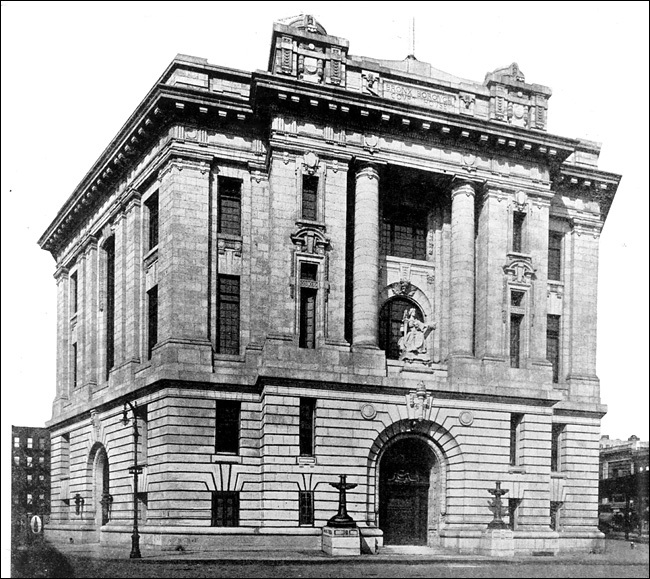 The Bronx Borough Courthouse in 1914. ALTHOUGH crooked politics and political injustices have driven New Yorkers to many bizarre actions, they have rarely transformed an architect into an artist. That, however, is what happened in the case of Oscar Bluemner, the sad-eyed German émigré with a shaggy mustache who designed the Bronx Borough Courthouse, the majestic Beaux-Arts structure that stands at 161st Street and Third Avenue in the Melrose section. Bluemner, the subject of a retrospective exhibition at the Whitney Museum of American Art that opens Friday, is celebrated today for his paintings, boldly outlined landscapes and cityscapes that pulsate with forceful, emotional color. But were it not for his clash with the powerful Bronx political machine around the turn of the century, he might never have emerged as an iconoclastic artist whose canvases startled audiences with their radiance and intensity. Born in a small Prussian town, Prenzlau, in 1867, Bluemner was trained as an architect, but he quickly tired of the Kaiser's repressive policies, and in 1892, at 25, he immigrated to the United States. For a brief moment, his future had promise. Just a year after arriving in New York, he entered an important competition for the design of a new City Hall in Manhattan, for which he proposed a five-story building - Romanesque Revival in spirit - topped by two spires and adorned with rows of arched windows. But even before a winner could be announced, the competition became mired in problems. The entries had been submitted anonymously to permit blind judging, but the names of the architects were somehow lost, and in the year it took to locate the list of architects and match them with their designs, the proposal to replace the old City Hall was jettisoned. A decade later, in 1903, Bluemner got what he thought was the commission of a lifetime, albeit through a highly circuitous route. A decade earlier, he worked briefly for Michael J. Garvin, a Tammany hack of little knowledge and less repute. Ten years later, Garvin was handed the plum job of designing the Bronx courthouse by Borough President Louis F. Haffen, presumably as repayment for political favors Garvin had performed while serving as Bronx superintendent of buildings. Garvin had no experience creating monumental public buildings; he had never even been trained as an architect. Using words like "egregious" and "despicable" to describe his plan, the Municipal Art Commission labeled it unacceptable and promptly vetoed it. In response, Garvin hired Bluemner to, in effect, ghost-design the building on a speculative basis: if Bluemner's design were accepted, Garvin would credit him as the architect and divide the $40,000 commission with him. Naïvely, Bluemner never bothered asking Garvin for a contract; as he testified in court later, it "never occurred to me that he would not keep his word." Although Bluemner worked for months on the design without pay, Garvin, far wiser in the ways of hard-knuckled urban politics, submitted it under his name alone. As The New York World reported, Garvin explained his action to Bluemner by saying: "Ability counts for nothing in politics. If you have the 'pull,' you get the work. I have the 'pull.' "
Bluemner's design called for a heavily ornamented structure inspired by the great classical monuments of Paris and Rome. Granite was chosen for the facade, the main entrance was topped by a monumental allegorical figure of Justice, and the interior was outfitted with terrazzo floors and marble walls and staircases. Bluemner's version of the future courthouse promised to be a gorgeous structure, and not surprisingly, it was promptly approved, whereupon Garvin claimed sole authorship of the building and refused to give Bluemner a penny. Bluemner turned around and sued Garvin for breach of contract. Garvin was ordered to pay Bluemner about $10,000. But he appealed the verdict, and the case was not finally settled until 1911, when the court ruled in favor of Bluemner, who finally received about $5,000. Nor did the drama end there. A crusading lawyer named John Purroy Mitchel, who was advancing his career by investigating municipal corruption and would go on to become mayor, seized on Bluemner's problems. As part of his cleanup, he campaigned to eliminate the office of borough president entirely, and after triumphantly removing the Manhattan borough president, Mitchel set his sights on Haffen, precisely because he had handed the courthouse commission to Garvin. Bluemner's testimony helped remove Haffen from office in 1909, after which Bluemner went on to help Mitchel investigate corruption in Queens and Brooklyn. Those investigations led to the forced retirement of the leaders of those boroughs; Bluemner later boasted that he had "helped dethrone three borough presidents." Much as Bluemner savored vindication, his experience with Garvin and the years of subsequent litigation left him so disillusioned that he abandoned any dreams of becoming a public architect. "To be of service to mere necessity, avarice, and folly, would be foolish or despicable," he wrote in his diary in 1908. "As a painter, only being free matters." Rather than design buildings, he decided to paint them. Yet Bluemner remained influenced by architecture. He planned out his compositions with highly structured sketches, and he liked to paint places where houses and industrial buildings came together, places that Barbara Haskell, the Whitney curator who organized the retrospective of Bluemner's works, calls "factoryscapes." Among the most striking of these are images of New York like "Evening Tones (Bronx River at Mt. Vernon)" and "Perth Amboy (Tottenville)," which feature large, simplified shapes, thick black outlines and intense primary colors. THE factoryscapes got Bluemner into the Armory Show in 1913 and two years later into 291, Alfred Stieglitz's avant-garde gallery. But although Bluemner's reputation as a Modernist pioneer was made, his bitterness continued to fester. In the late teens, not long after his breakthrough as an artist, he wrote to Stieglitz that he would "rather be a bum painter than a 'successful' so-called architect - life is more than the monkey parades on 5th Avenue." Today, the building responsible for both Bluemner's anguish and his liberation sits boarded up and empty. Though it served for a time as a hub of civic life in the South Bronx, the Art Moderne Bronx County Courthouse took its place in the mid-30's. The older courthouse was vacated in 1978, but because it was designated as an historic landmark in 1981, it cannot be destroyed. Various neighborhood groups, notably an organization called Nos Quedamos ("We Stay"), hoped to rehabilitate the property, but in 1996, after estimating that renovation would cost $43 million, the city sold the building to private developers for $130,000. "The sale broke our hearts," Gilberto Rivera, the group's president, said the other day. "But we are still seeking permission to make the building into a civic center, with a library, an information clearinghouse and other community facilities. And we are not sleeping. Because the building is a landmark, we want to make sure that it is not used for anything negative." Avis Berman is the editor of "My Love Affair with Modern Art: Behind the Scenes With a Legendary Curator," by Katharine Kuh, to be published by Arcade in January. 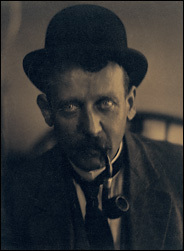 Oscar Bluemner, courtesy of Alfred Stieglitz. An incredible building, but there's no clear answer as to how to finance its preservation. More photos here http://ltvsquad.com/Missions/Buildings/Court2/index.php showing the sad state of the interior. I'm baffled that the sale price for this building in 1996 was only 130K! ^ That's because it is a white elephant. Virtually useless in its current condition. In need of huge amounts of $$ to get it into any state of usability. Perhaps it could be a museum. It would work well as a home for the Bronx Conservatory of Music though a bit South of the Bronx Community College Campus, the courtrooms seem ideal for chamber music and black box type recitals. This likely won't work, but what about the Bronx Opera Company? If I remember correctly, they don't have their own space. The problem: " ... in 1996, after estimating that renovation would cost $43 million ... "
Any guesses what that cost might have esclated to 11 years later? No, that would be the current courthouse, the Art-Moderne structure that's within sight of Yankee Stadium. Another famous building described in that chapter is the Concourse Hotel, which in the book was a welfare hotel and is now used a home for seniors. The building, in the South Bronx, will become a charter school for 800 students. The cells in the old Bronx Borough Courthouse, which was vacated by the city in the 1970's, will be replaced by classrooms. For more than 30 years, the old Bronx Borough Courthouse in the South Bronx, with its statue of Justice overlooking Third Avenue, has sat empty, another abandoned building in a neighborhood filled with them. But in yet another sign of the South Bronx's robust economic rebound, officials said yesterday that the 91-year-old Beaux-Arts courthouse would finally be getting a tenant. Imagine Schools, a nonprofit charter school organization based in Arlington, Va., has reached a tentative agreement on a 25-year lease with the courthouse's owner, and plans to open an 800-student charter school inside the landmark building in the Melrose section by September 2007. The owner, Henry Weinstein, who bought the 82,000-square-foot building for $300,000 at a city auction in 1999, said he had been trying for years to find a group interested in renting it, no easy task in a neighborhood short on housing, stores and basic services like banks and dry cleaners. "We're very happy, because we think we've found a worthy user," said Mr. Weinstein. "This is a sign of the overall South Bronx revitalization. One by one, each vacant site is being spoken for." Mr. Weinstein said he expected to spend $20 million to $30 million renovating the building, replacing elevators and bathrooms, installing a "green" roof that will serve as a playground, refurbishing the courthouse's twin marble staircases and dismantling 70 jail cells. The school, which will run from kindergarten to eighth grade, will have 36 classrooms, a cafeteria, a gymnasium and an auditorium. "It's a grand old building with a lot of interior space," said Philip Parr, a regional school developer for Imagine Schools. "It's a very, very classic and dignified space." The charter school, whose application still needs to be approved by the Department of Education and the State Board of Regents, will emphasize career development and conflict resolution. The Rev. Timothy Birkett, the pastor of a congregation called Church Alive, in the South Bronx, who has been an adviser to Mr. Weinstein, said that in addition to academics, the school would seek to instill leadership qualities in children, an emphasis that he said was lacking in the area's public schools. "That's what the basic education system is not doing," said Mr. Birkett, who will serve on the school's advisory board. The charter school will most likely be called "the Gray Lady," the courthouse's nickname in its neighborhood, Melrose. The neighborhood, one of the hardest hit by arson and abandonment in the South Bronx during the 1970's and 80's, has slowly recovered in recent years, and there are plans for more new housing and shopping centers in the area, which is about a mile east of Yankee Stadium. The borough courthouse, completed in 1915, had once been the center of civic life in the Bronx. It had been part of a complex of government buildings in the area that have long since been torn down, with the exception of another old courthouse across the street that is slated for demolition. The borough courthouse has been vacant since the 1970's — though the exact year is unclear. Mr. Weinstein and the building's neighbors say it has been empty since 1972, though the city puts the year at 1978. The building's chandeliers, its bronze window frames and almost everything else of value were carried off by scavengers years ago. But the courthouse, declared a city landmark in 1981, still has its Tennessee marble statue of Justice — without her traditional blindfold — perched on a central bay on the exterior of the building's second floor. The building's unusual design made it hard to find a tenant, Mr. Weinstein said. "It's an architectural antique, inside and out," he said. "It was meant for public use, so it has grand rotundas. It doesn't necessarily lend itself to an economical use." The courthouse has a checkered history — even before it was completed, people complained that it was too grand for the Bronx. The building's designer, Oscar Bluemner, filed a lawsuit after a Tammany official claimed the credit — and the commission — for the design. By the time it was finished — a decade late and at a cost of $2 million, more than twice the projected amount — the courthouse's white granite exterior had started to yellow. When it opened for business, judges and prosecutors realized they could not be heard above the screech of elevated trains along the tracks that passed within a few feet of the building. 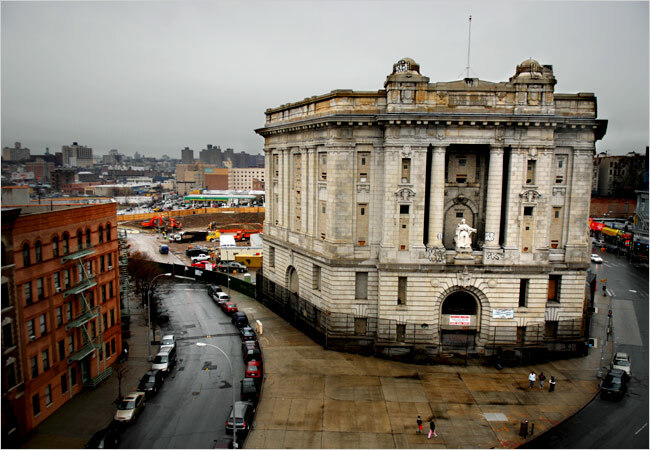 By the time the elevated line was torn down in the early 1970's, the courthouse had become obsolete — the current courthouse, near Yankee Stadium, opened in the 1930's. Mr. Weinstein bought the building after another buyer defaulted. And though Imagine Schools tried to buy the building from Mr. Weinstein, rather than leasing it, he declined, partly for sentimental reasons. "It's a very special building," he said. Finally!! This ^^ is great news. A 93-year-old South Bronx courthouse that has been designated a landmark but has been boarded up for years will become a charter school in the fall, officials said last week. The Bronx Borough Courthouse, at Third Avenue and 161st Street, will become the Bronx Academy of Promise Charter School, starting with kindergarten to second grade. The Bronx Borough Courthouse, with a Tennessee marble statue of Justice — without a blindfold — will reopen in September as a school for kindergarten through second grade and will expand by a grade a year until it reaches the eighth grade. The school will be called the Bronx Academy of Promise Charter School and will be run by Imagine Schools, a nonprofit organization based in Arlington, Va., said Melody Meyer, a spokeswoman for the city’s Department of Education. Imagine Schools had been seeking city and state approval to operate the school since 2006, but the organization ran into a state limit on how many charter schools could be authorized. Last year the state allowed 50 more charter schools in the city, in addition to 60 currently operating, and the state’s Board of Regents recently approved Imagine’s application. Charter schools, whose intent is to give students more educational options, are publicly financed schools that operate with greater independence from the Department of Education than traditional public schools. Imagine, which runs about 70 schools in the United States, will operate the charter school with Urban Youth Alliance, a private nonprofit group. In 2005, Imagine Schools lost its charter for a Syracuse elementary school after the State University of New York criticized the way it administered the school. That school, the Central New York Charter School for Math and Science, had low test scores and high turnover among students and staff members. Ms. Meyer said that the city’s Department of Education was aware of Imagine’s problems at its Syracuse school, but that it was sure the company could run a good school in the Bronx. “They were approved after completing a rigorous selection process, and we are confident that they will serve our students well,” she said. Its new home, which has been gutted and still needs work, has had a colorful history. 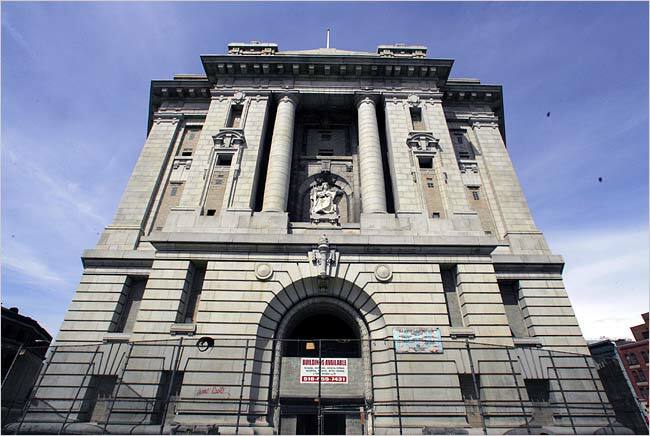 Completed in 1915, the 82,000-square-foot courthouse is an example of Beaux-Arts architecture. It was once the center of civic life in the Bronx, the grandest structure among a complex of government buildings in the Melrose neighborhood, which have since been torn down. By the time it was finished, however, it was $2 million over budget and a decade late. The white granite exterior had begun to yellow, and after a Tammany official claimed credit — and the commission — for the building, the designer, Oscar Bluemner, filed a lawsuit. 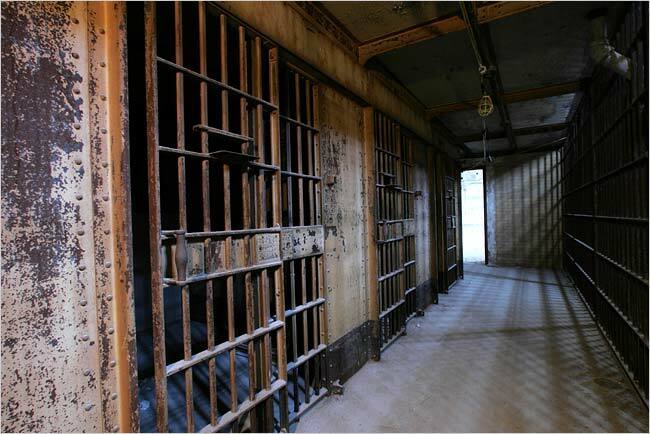 New problems emerged once trials started in the courthouse. Judges and prosecutors found that their voices could often not be heard above the screech of trains that passed within a few feet of the building on elevated tracks. Windows had to be closed, making the courtrooms stiflingly hot. Within a few years, the borough’s growing population made the courthouse obsolete, and beginning in the 1930s, the city built larger courthouses near Yankee Stadium, about 15 blocks to the west. Over the years, the building has been used for night court and has served as a storage library for artwork. It has been vacant since the 1970s, although the exact year is unclear. The current owner, Henry Weinstein, said neighbors told him it had been empty since 1972, though the city puts the date at 1978. The Melrose and adjacent Morrisania neighborhoods were among the hardest hit during a wave of arson in the South Bronx in the 1970s and ’80s. But the courthouse’s landmark status spared it from demolition, and at various times developers and community activists proposed turning it into television studios, medical offices, a community center and a Puerto Rican museum. A community group, Nos Quedamos, which means “we stay,” is building much of the affordable housing in the area and tried unsuccessfully to buy the courthouse several times. Now thousands of units of affordable housing are planned for the surrounding area, and Boricua College, a four-year college, is building a campus next to the courthouse. The rent for the school’s use is still being negotiated. Chandeliers, bronze window frames and almost everything else of value were carried off by scavengers years ago, and recently thieves took copper heating pipes, apparently because of copper’s rising value as scrap metal. A bit of good news for Lofter on his return from London.